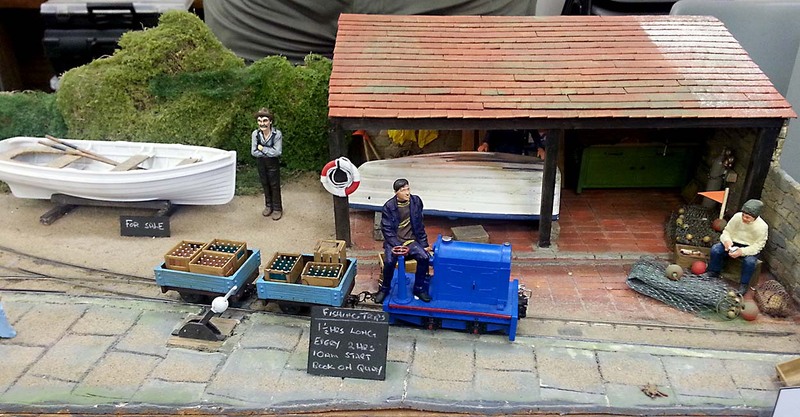 Last weekend I showed ‘First’ at the Norfolk and Suffolk Narrow Gauge Modellers Open Day. It was an excellent day. 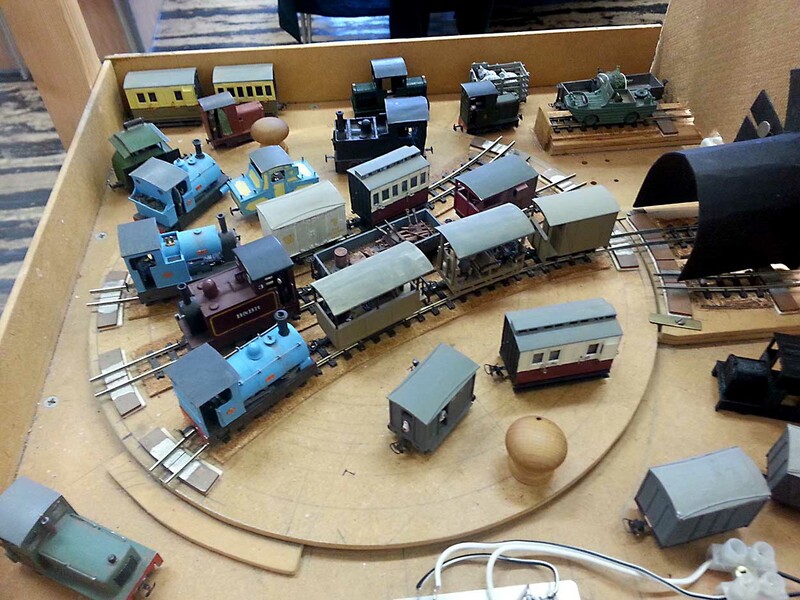 There was an extra room of layouts this year. This created space for more layouts and a lot more space around the layouts. Richard Doe and the N&SNG team run a well organised event and create a very relaxed, friendly atmosphere. It was great to chat to people and make new friends. It wasn’t all plain sailing, I had a surprise just before the exhibition opened. 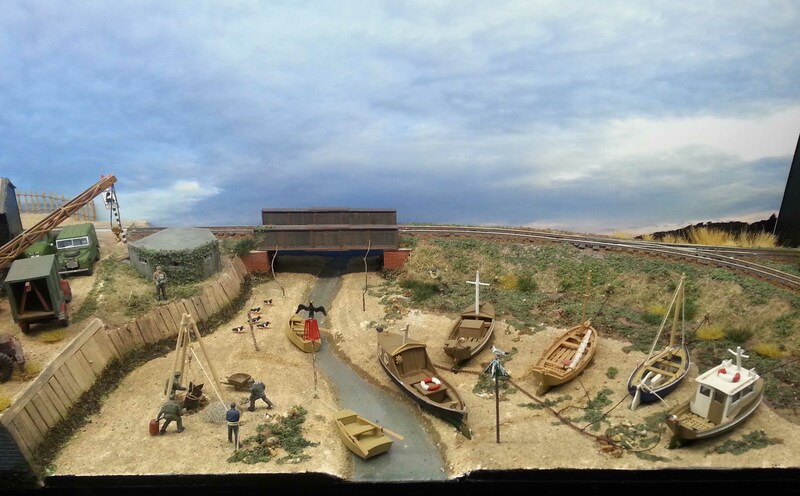 I arrived in Beccles in plenty of time and set up the layout. Twenty minutes before the doors opened I was starting to run some trains when one of the point motors stopped working. I removed the stock and started poking around under the layout to see what the problem was. Luckily, Tony Clarke offered to help and we figured out the problem was likely to be a dodgy switch. I replaced the point switch, and had something running as the first visitors came in (just). Many thanks to Tony for his help. The layouts were great. I spent most of the day operating and I wish I’d had more time to study them. I had a few minutes to grab some pictures of the layouts closest to me at the end of the day. Chris O’Donoghue exhibited Compass Point. 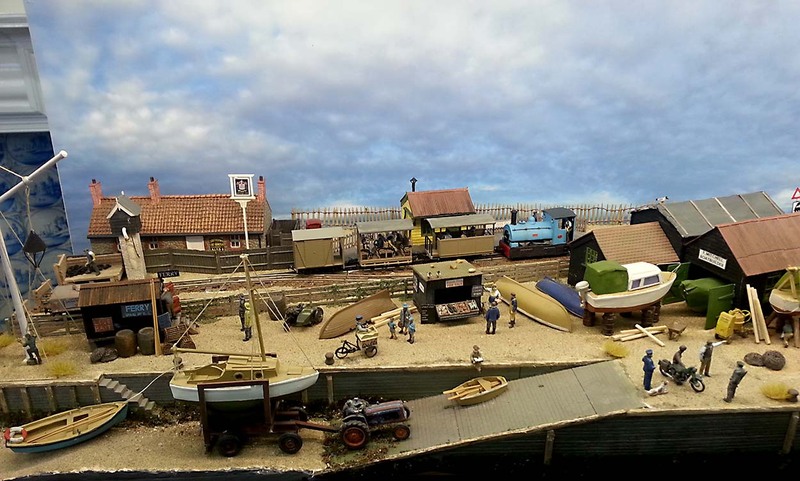 His highly detailed OO9 layout is full of interesting scenes and cameos. It was very popular with the visitors. Chris’s attention to detail is astounding. The mooring ropes of the two boats in the estuary are stretched tight because they would have been pulled taught as the boats were dragged seawards by the descending tide. (Gasp!). Chris had a very eclectic mix of stock in his fiddle yard. There’s even an aquatic Jeep. It was great to chat with Chris and he gave me some good ideas for how I can improve the presentation of ‘First’. Thanks Chris. Green End by David Gander is another example of excellent modelling. 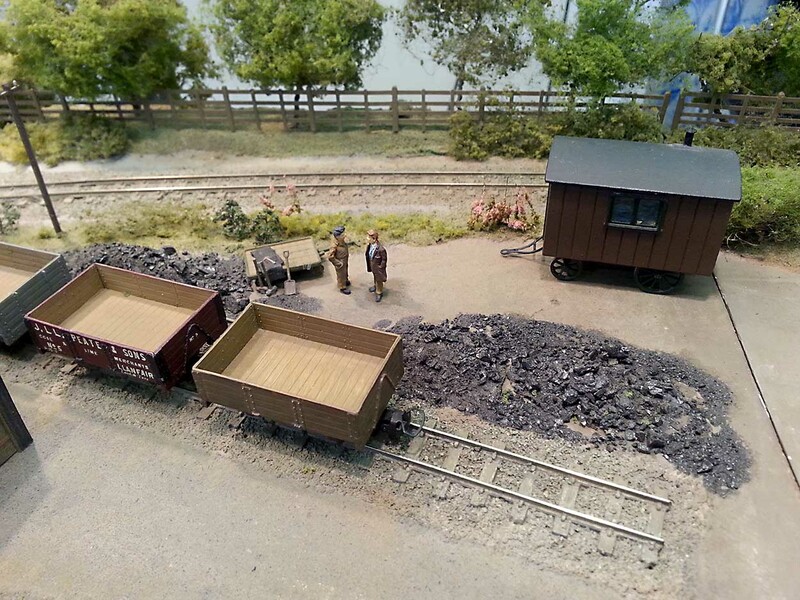 The style is very different from Compass Point, the layout is much less populated and captures the feel of a sleepy, rural narrow gauge line. Green End is inspired by the Welshpool and Llanfair. It was nice to see a ‘J L L Peate and Sons’ private wagon. I’ve always liked the livery – very showy for a coal merchant. 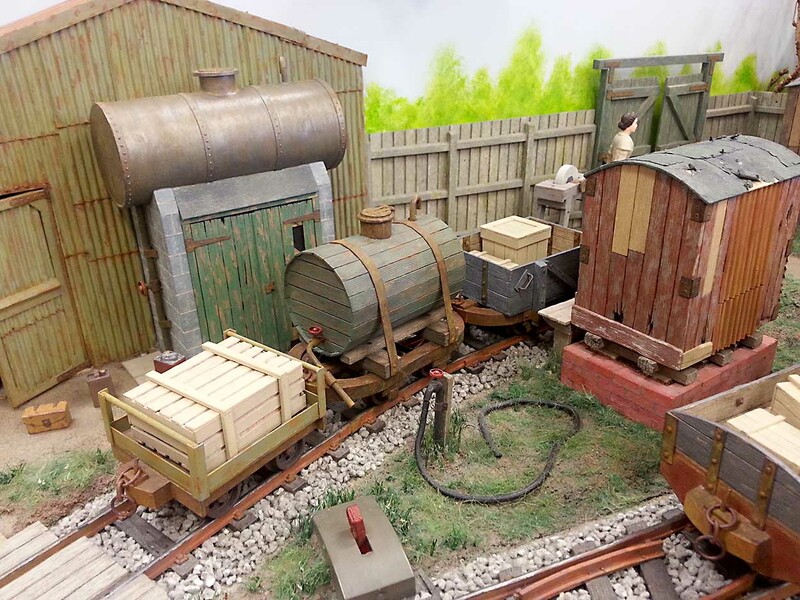 I was impressed by the stock on Bill Knight’s 1:16 scale layout Knights Yard. 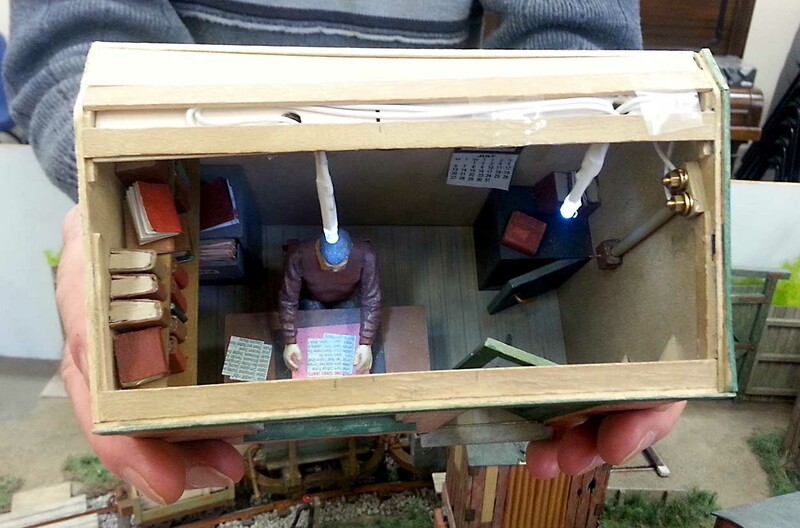 Full of character, well detailed, well weathered… and entirely made of card. Yes you read that right, made of card. Bill has detailed the interiors of the buildings too. Here’s the yard office. The books and ledgers have individual pages. You can open a book and flip through the pages. 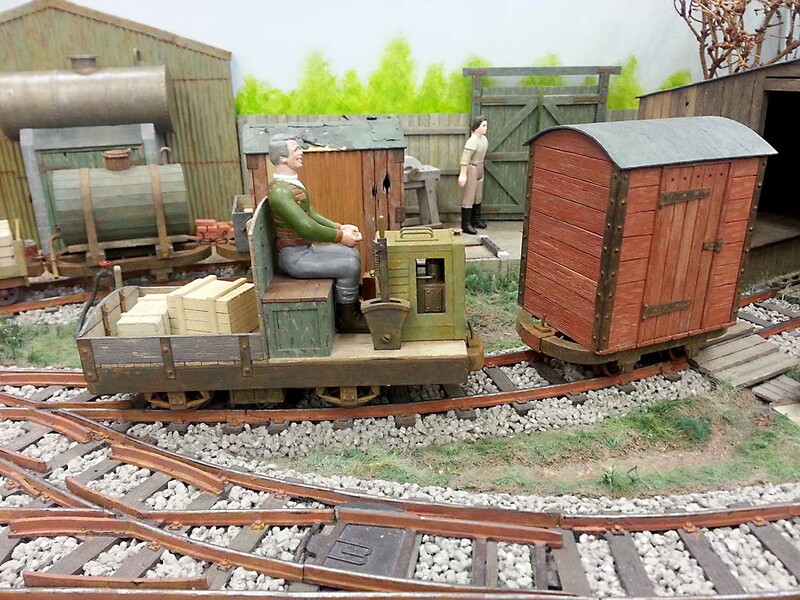 As I visit more exhibitions, I’m realising that layouts don’t need to be complex to be good. Here are three simple, effective layouts and each one has only one point. Hawkins Tower by Phillip Moore (OO9) is a Victorian park complete with a folly. I particularly like the wrought iron table and chairs outside the ‘Current Bun’ cafe. 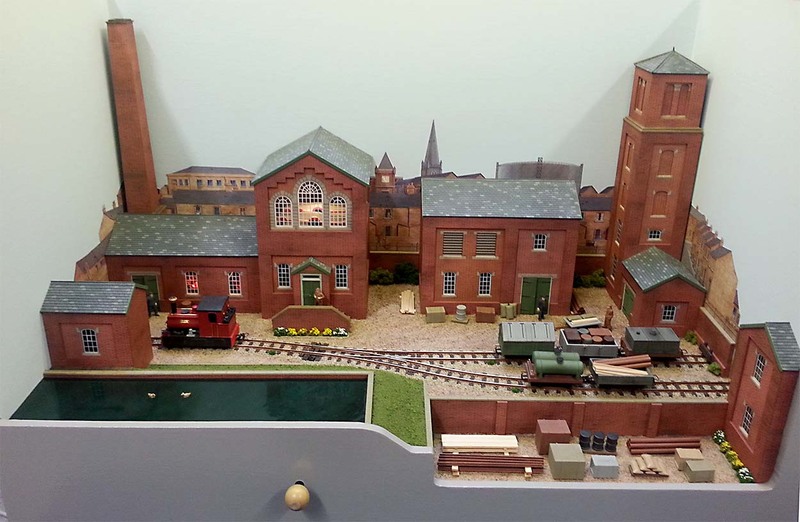 Also from the Victorian era, Priory Waterworks by Chris Seago. 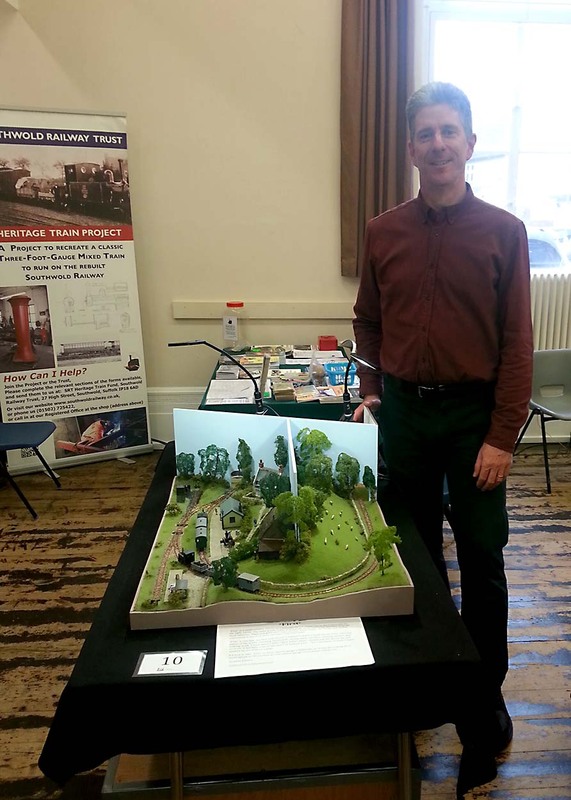 Chris is really good at modelling these lovely industrial buildings. 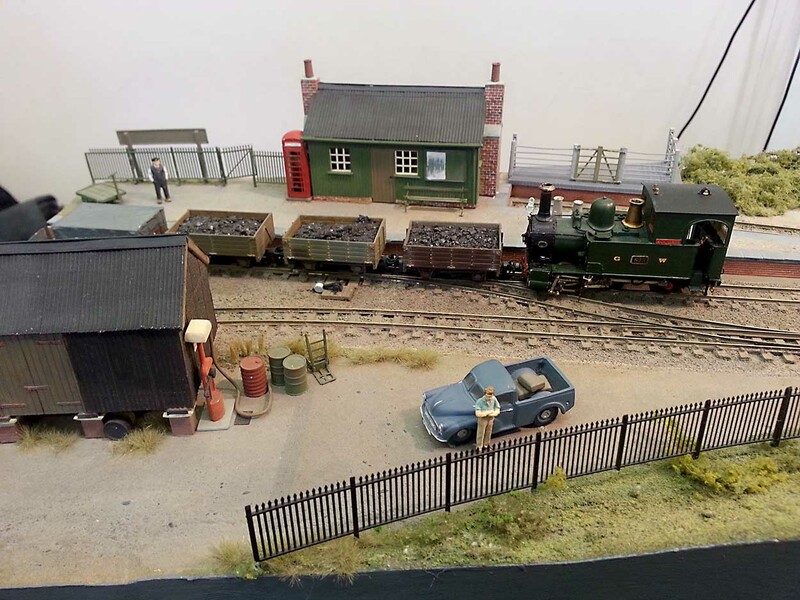 A great example of keeping it simple, it’s a working layout using one point and three lengths of track. I like the knob to change the point. Chris wont be let down by dodgy electrics. 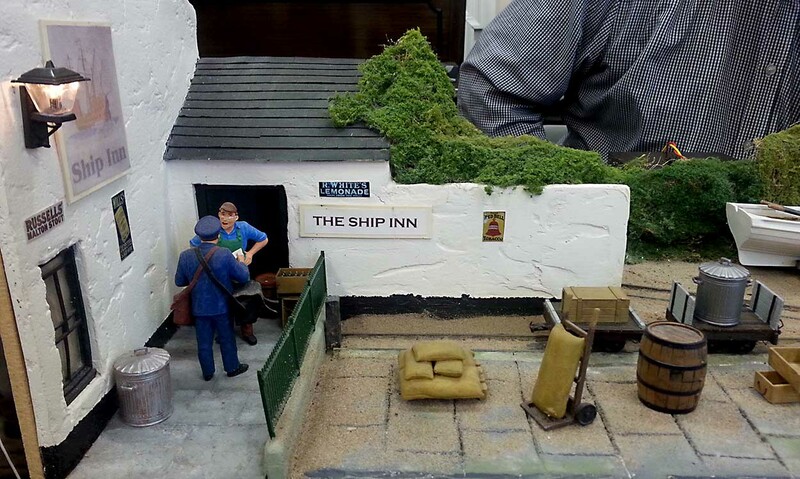 Finally, possibly my favourite layout of the day was Ship Inn by Barry Weston. It’s G scale with 16.5mm track to represent a 15 inch gauge line. I think what attracted me was the sheer simplicity of the track plan and the wonderful character of the modelling. …and to the quay. And that’s about it, but I could look at it for hours. The ladies of the Great Yarmouth Brass band organised the refreshments. Unfortunately, I only got one slice of Victoria sponge this year, it had sold out by the time I went back for seconds. Obviously word is getting around about how good the cakes are! For each of the exhibitors Stuart Hughes created these cast aluminium plaques. They are about 8cm (3 inches) long and are very impressive. At the end of the day several of us adjourned to the pub for a meal, a pint and a good natter. A great way to finish a very enjoyable day. Many thanks to Richard and the team for another excellent Open Day.